This page provides instructions on how to update the firmware for Digital Photo Frame DPF-WA700. Note: Before starting the update, we recommend that you back up to a computer or a memory card the image and music data that are saved on the digital photo frame's internal memory. Continuous use of the photo frame in accordance with Facebook's specification changes. You will not be able to receive photos from users who are registered as friends on Facebook. However, you will be able to receive photos in which you are tagged, and photos from friends who use the DPF-WA700. This update will also change how frequently Facebook is accessed. Press MENU on the rear of the photo frame. Tap Settings. 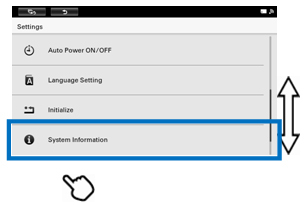 The Settings menu appears. 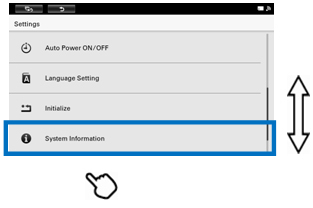 Drag with your finger to scroll though the list and tap to select System Information. The numbers below version indicate the present firmware version of your photo frame. - If the version is displayed as 1.38.43 or lower, update the firmware in accordance with below procedures. 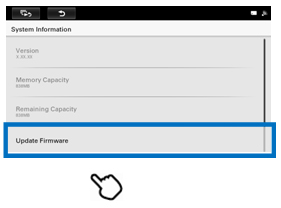 - If the version is displayed as 1.40.43, you do not need to update the firmware. After you have checked the firmware version, tap (Back). The screen returns to the Settings menu. Check the firmware version is completed. Update can be made by either of the following two methods. The digital photo frame is equipped with wireless LAN function. The Internet via a wireless LAN network. 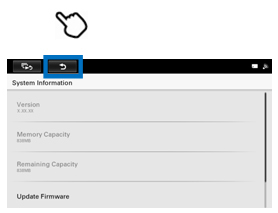 The latest firmware version is automatically displayed, when it is found. * Data in internal memory and information on your e-mail settings are not cleared. If you are using Windows 10, Windows 8.1, Windows 8, please use it in desktop mode. One of the following types of recording media (Memory capacity is between 128 MB and 32 GB). For details on compatible recording media, see Compatible Memory Card/USB flash drive in the Digital Photo Frame Handbook. You should therefore always use a Memory Stick Duo that has just been initialized (formatted). Please use a Memory Stick Duo that has been initialized (formatted) by your digital camera, or initialized (formatted) by the dedicated Memory Stick formatting software Memory Stick Formatter. You must accept the terms of the Terms & Conditions on this page. After reading this agreement, check the "I have agreed with the Terms & Conditions" box above. The download of the DSF70V08.zip 72.2 MB (75,782,636 bytes) file will start. Note: This is the dedicated update file for DPF-WA700 only. You cannot use this file with other Sony digital photo frames. The DSF70V08 folder is now open on your computer's desktop. Double-click the saved file DSF70V08.zip. The DSF70V08 folder is created on your desktop. The unzipped DSF70V08 folder contains the following update file: DSF70V08.DUP. 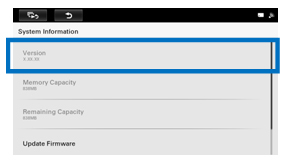 Depending on your operating environment, some file extensions (.DUO / .dup ) may not be displayed. 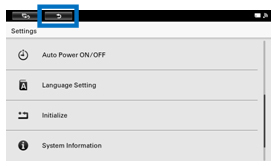 The following section describes how to update using a Memory Stick Duo. If you are using an SD memory card or USB flash drive, please replace Memory Stick Duo with your device using recording media in the following explanations. Insert the initialized (formatted) Memory Stick Duo into the Memory Stick slot on your computer. Open the DSF70V08 folder on your desktop, and copy the update file DSF70V08.DUP inside it to the Memory Stick Duo. Drag and drop the update file to the root of the Memory Stick Duo without creating any new folder for it. Insert the initialized (formatted) Memory Stick Duo into the Memory Stick slot on your digital camera. Open the DSF70V08 folder on your desktop, and copy the update file DSF70V08.DUP inside it to the Memory Stick Duo that you have inserted into your digital camera. Drag and drop the update file to the root of the Memory Stick Duo, without creating any new folder for it. Note: During the update, ensure that the digital photo frame and the AC adaptor are placed on a stable location, so that the AC adaptor may not be removed and the digital photo frame is not turned off. Loss of power during the update may cause the digital photo frame to malfunction. Plug the AC adapter attached to the set into the DC IN terminal on the rear of the digital photo frame and insert the power cord into the socket. The photo frame is automatically turned on. Insert the Memory Stick Duo containing the copied update file into the slot on the digital photo frame. Press MENU on the rear of the photo frame. The menu appears. Check Version and tap Update Firmware. Tap Download. The copy of an update file is started to the internal memory of a digital photo frame. - Although the display of a screen is download, the update file is copied to the internal memory of a digital photo frame. - The text displayed on digital photo frame differ by the firmware version. During the copy of update file, ensure that the digital photo frame and the AC adaptor are placed on a stable location, so that the AC adaptor may not be removed and the digital photo frame is not turned off. Also ensure that the Memory Stick Duo is firmly inserted into the digital photo frame during the update so that it cannot fall out. 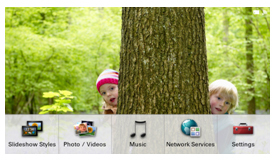 The digital photo frame may malfunction if power to the device is lost, or if the Memory Stick Duo is removed during the update. After the copy of an update file is completed, tap Restart to update. 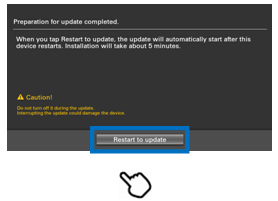 The update will automatically start after this device restart. After update finishes, a digital photo frame restarts automatically. Note: The first time you turn the power on after the update, the digital photo frame will take longer to start than usual. 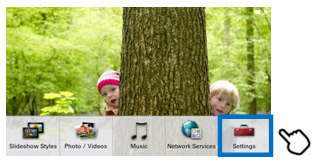 Remove the Memory Stick Duo from the digital photo frame. After the update, please confirm the firmware version accordance. If the firmware version is displayed as 1.40.43, the firmware update was performed correctly. The firmware update was not performed correctly. Perform the firmware update again from the beginning. This completes the update procedure of the firmware. The update file in the Memory Stick Duo is not needed anymore after you performed the firmware update. Please remove it from your Memory Stick Duo.